The overall design of the Wave FF is strongly influenced by the development of the blade. Based on Mares Channel Thrust Technology, it envelopes a large volume of water in the central area, which is then propelled out generating thrust with high efficiency. The three material constructions allowed Mares to select the best possible TPR for the foot pocket and thus obtain the highest comfort, while applying materials with the best elastic properties for the blade aiming at reaching the highest performance. 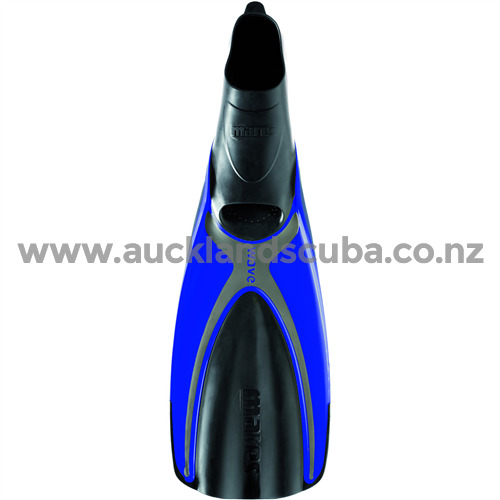 The Blade of the Wave Full Foot Fins is manufactured from Techno-Polymers and has a blade length of 14 17" (36 cm). The Channel Thrust Technology incorporates soft longitudinal inserts that allow a controlled deformation of the fin blade while kicking. This channel shape moves a greater amount of water resulting in more thrust for the same effort. The Mares Wave FF Fins weigh 1.32 lbs (0.60 kg) and come in 6 Sizes: 4.5/5, 6/7, 7.5/8, 8.5/9, 10.5/11.5 and 12/13 (EUR: 36/37, 38/39, 40/41, 42/43, 44/45 and 46/47) Fins are available Black, Blue and Yellow Colors. The Mares Wave Full Foot Fins is commonly used for Snorkeling, Travel and more. The Mares Wave Full Foot Fins is most used by customers who consider themselves to be a Advanced, Casual/ Recreational among others. The Mares Wave Full Foot Fins is popular because customers like the following qualities of the Mares Wave Full Foot Fins: Comfortable, Lightweight.